This card is a stepped-up version of one my upline created and demonstrated to me. I just loved it and couldn't resist adding some glitter, pearls, and ribbon to the free. 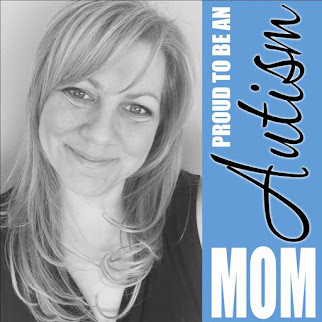 A very fancy card that I gave my mom this year. NOTE: I also created a version using Basic Gray ink and cardstock instead of Old Olive and it looked just as good! Cut a piece of wax paper. Using Crystal Effects, draw a line of crystal effects on the wax paper (at least 4-1/4). Then using the tip of the crystal effects bottle, "pull" some of the crystal effects down to create the icycle look. Then cover with Dazzling Diamonds glitter. This takes some time to dry!!! I waited over night before adhering to card front (top). Stamp the Snow Swirled Tree on Whisper White cardstock. Add glitter where desired using two-way glue pen and Dazzling Diamonds. Add pearls from the Pretties Kit and adhere using Mini Glue Dots to desired locations on the tree. I used 2 different sizes. 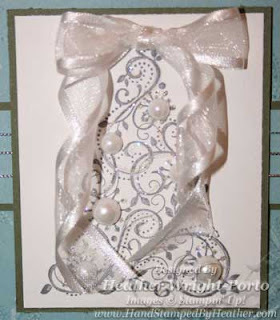 Create a bow from ribbon and adhere to top of tree using Mini Glue Dots. Twirl the ribbon ends and adhere the bottom with a Mini Glue Dot. 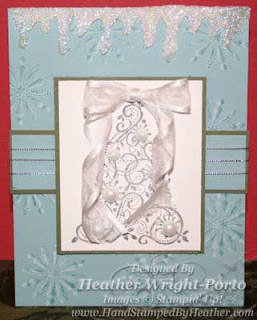 Adhere this panel to card front using Stampin' Dimensionals. Stamp Snow Swirled Snowflakes in Baja Breeze. Now re-stamp over the existing snowflakes with Whisper White Craft Ink. Allow a few minutes to dry. Using the smaller strips, adhere the Baja Breeze horizontal strip onto the Old Olive horizontal strip. Wrap silver cord around the strips 3 times. Adhere strip to card front with SNAIL Adhesive. When the icycle trim is dried, using SNAIL adhesive along the top, then place the trim on top of it. Or use a few drops of Crystal Effects across the top and then place the trim on top of it.